As far back as anyone can remember, humanity has been at war with itself. For generations, kingdoms have fought amongst themselves while the real threat loomed in the distance. Legend calls them the Ravenii, encroaching armies of bloodthirsty monsters standing 150 feet tall that once threatened to destroy humankind. Now the threat has returned, and only those trained in the ways of the ancient order stand a chance at defeating the ogres. You are one of the world’s last Sentinels, a soldier named Avil equipped with the skills to battle the endless wave of Ravenii. 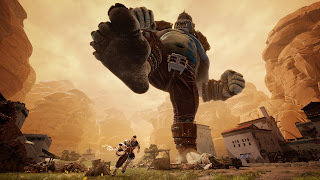 Fight massive brutes and their minions across a sprawling countryside, defending cities and rescuing refugees torn from their homes. Swiftly define your strategy as hordes attack from the ground and air. Use the dynamic skill-based combat system to your advantage, tactically disarming and dismembering enemies to go in for the kill. This is no longer a war. It is an annihilation. And you are all that stands between humanity…and extinction. 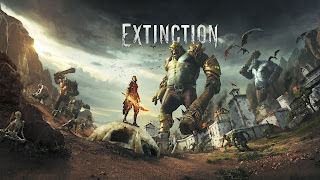 Extinction will be shown off behind closed doors at E3 2017,the game is coming to PlayStation 4, Xbox One, and PC in Q1 2018.